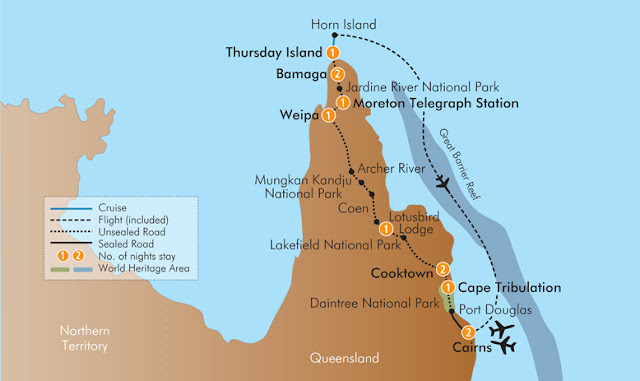 At last I found a map of our trip to Cape York. After our hike to the tip of Australia we returned to Bamaga for another night. The next morning Chris, our driver took us to the wharf where we said goodbye to him. 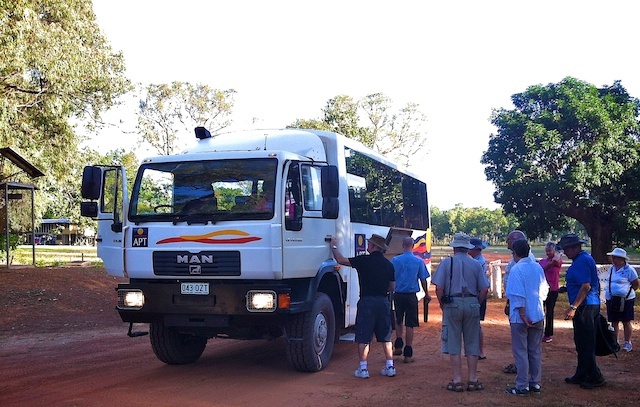 Chris had to drive the bus back to Cairns to pick up the next tour group. 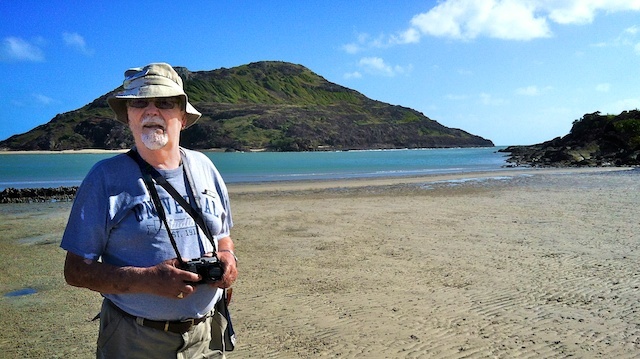 We were to catch a ferry across to Thursday Island, where we would meet another guide. 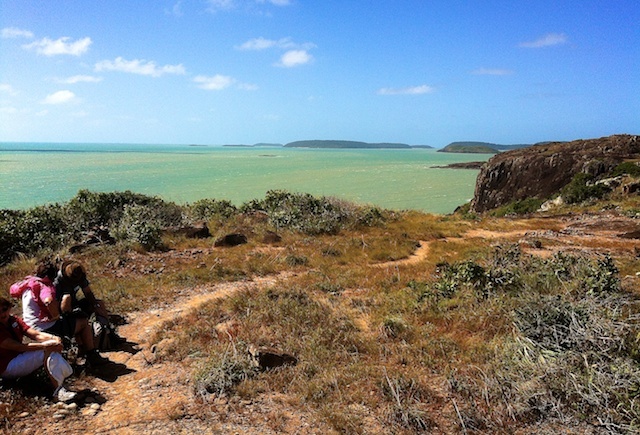 Thursday Island is one of many islands in the Torres Strait. 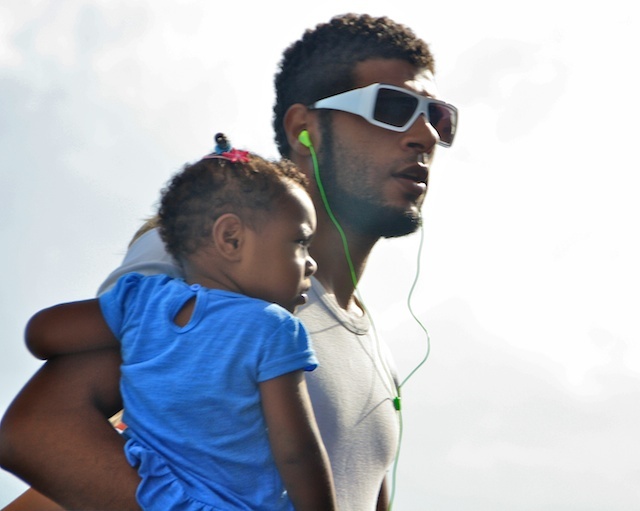 TI as it is known has the best harbour and biggest population of all the islands. In 1606 The Spanish explorer, Luis Vaez de Torres, was the first European to navigate the strait between New Guinea and Australia. 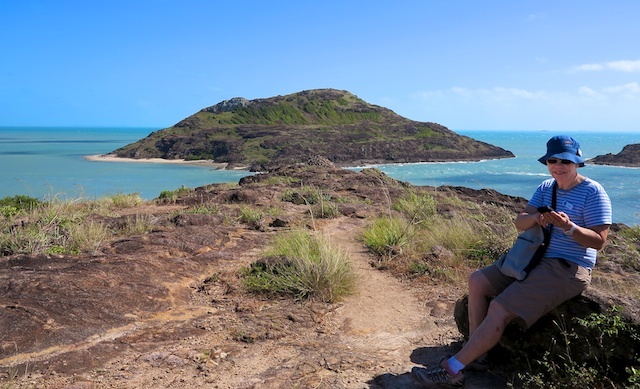 He was looking for Australia but he thought the tip of Cape York was just another island and so missed claiming Australia for Spain. However, the strait was named after him. It is only 150k/90m from Cape York to New Guinea. 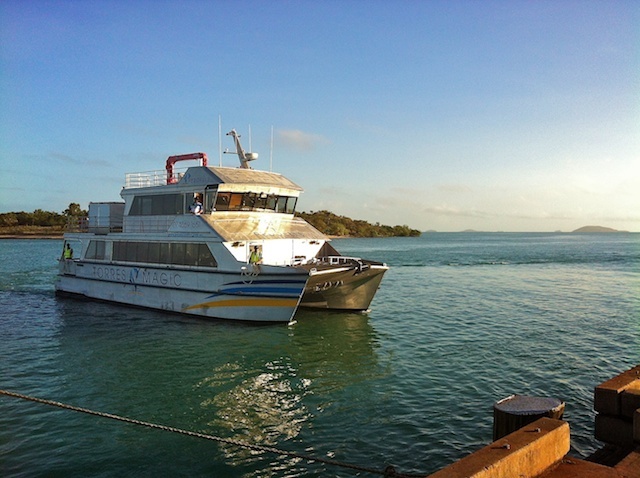 The ferry took us to Thursday Island. 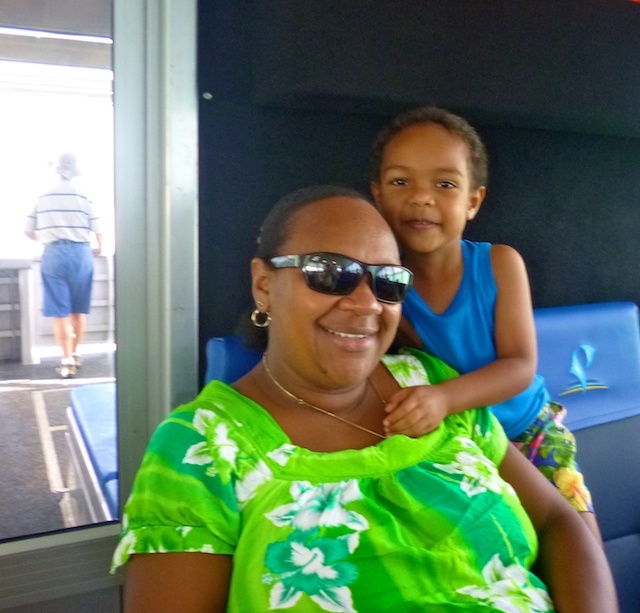 Torres Strait Islanders on board the ferry. Cute kids. 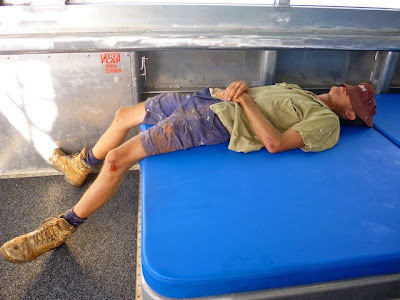 Not sure if this Tradie had a big night or if he's been working hard but he was catching up on some sleep on the ferry. 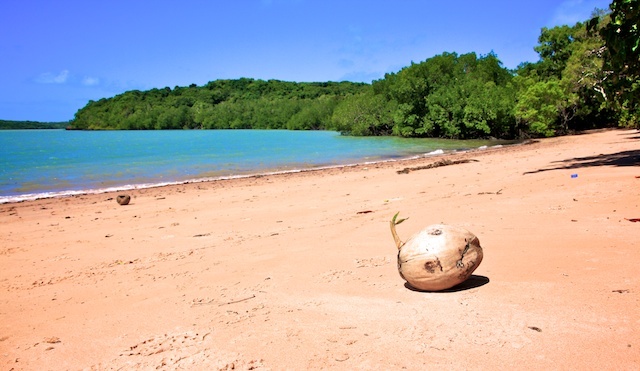 People up here in the tropics are very laid back. No one is in a hurry, nothing is urgent. 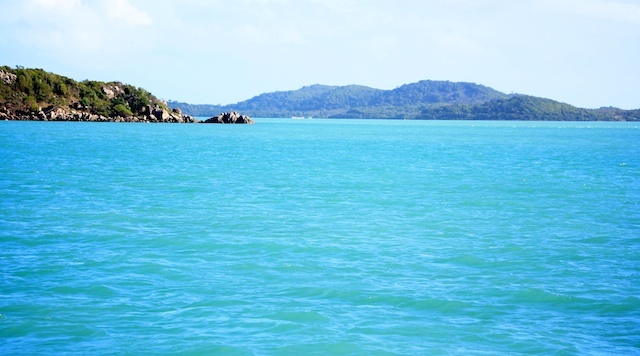 We sailed between islands and the water was a magic colour. As soon as we arrived we were ushered onto a tour bus with a local girl as driver and guide. 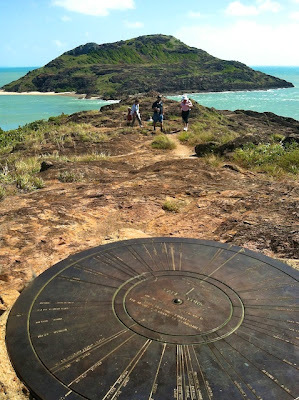 She took us to the top of "Green Hill", which is actually brown in the dry season. At the top we had a view over the settlement. There was a fort built on the top of the hill in the 1890's when the government was expecting an invasion by Russia. 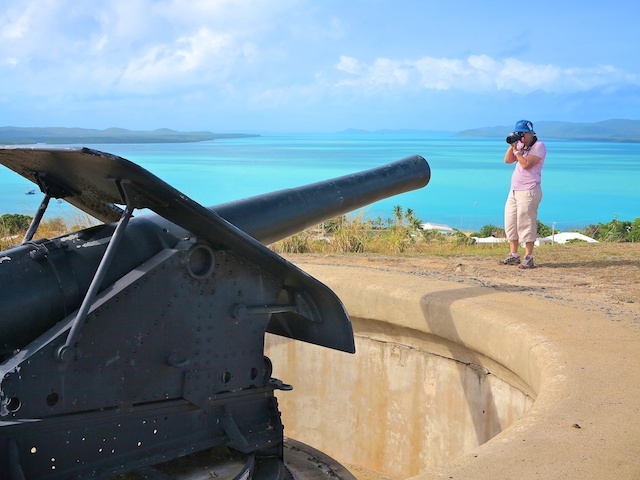 The guns have only been fired once when a friendly ship came into the harbour but didn't identify itself. Underneath the ground there is a museum which used to be where the ammunition was stored. 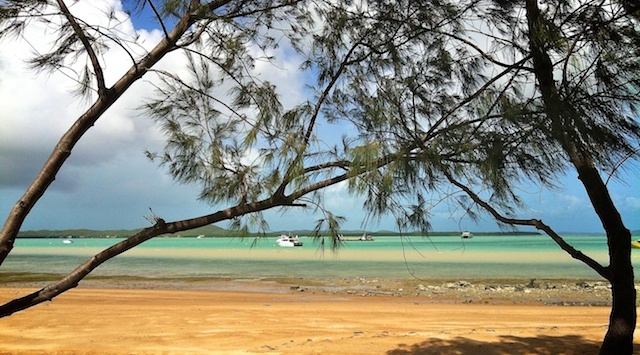 The view, heat and colours reminded me of the time I lived in New Guinea, very tropical. 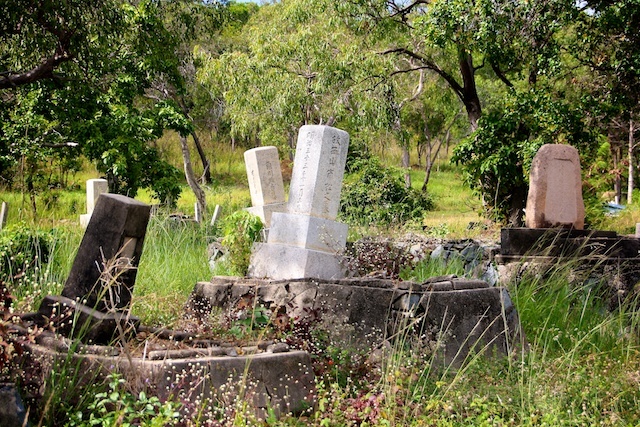 We visited the historic cemetery where hundreds of japanese pearl divers are buried from the times in the 1800's when the pearling industry was thriving here before plastics took over. Then it was time to book into the Jardine Motel. We had fish and chips for lunch, settled into our room and then we went for a walk to explore the little township. The beach was at the end of the main street. The Anglican All Saints and Bartholomew Church is actually the smallest cathedral in the world. 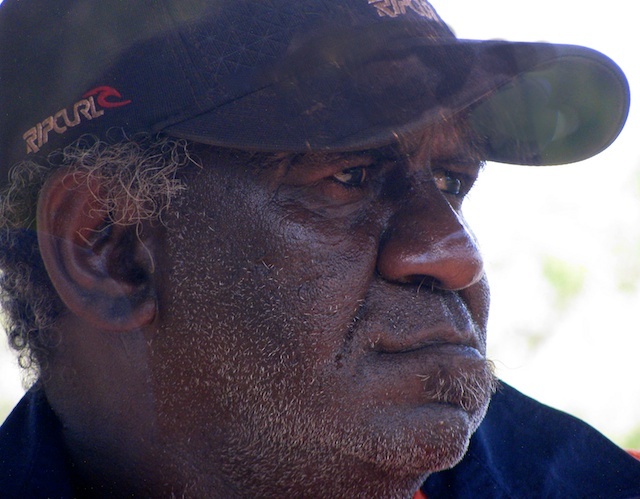 The right Reverend Bishop Saibo Marbo is a special bishop for the Torres Strait Island people. 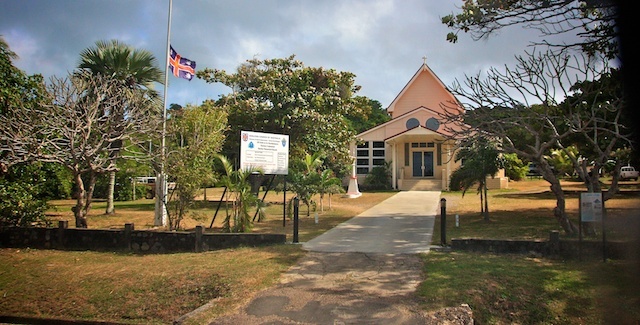 The church is also called the Quetto Memorial Church. In 1890 the ship, Quetta, hit rocks on its way from Brisbane to London. It sank within 3 minutes at night. 133 lives were lost out of 293 passengers. The dead were buried here. The flag is at half mast as an important Island elder died. 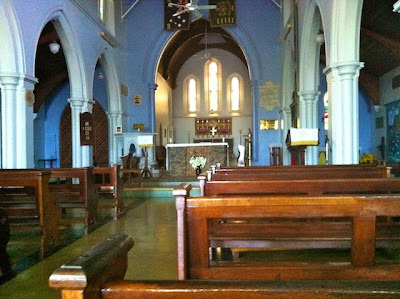 There was Quetta memorabilia in the church and a portrait of an islander leader in traditional dress. 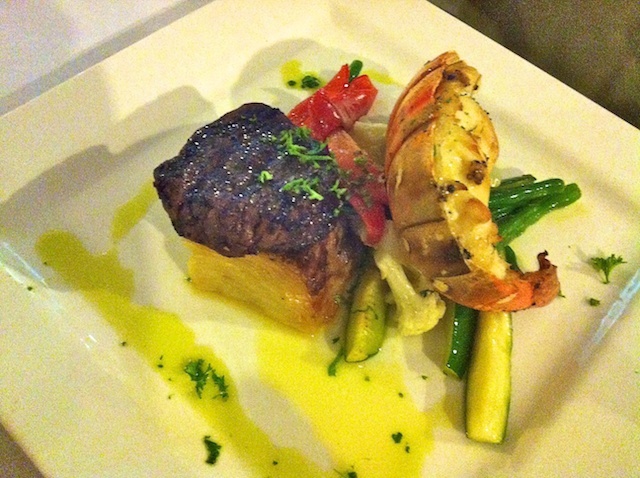 Dinner at the motel was delicious Reef and Beef. 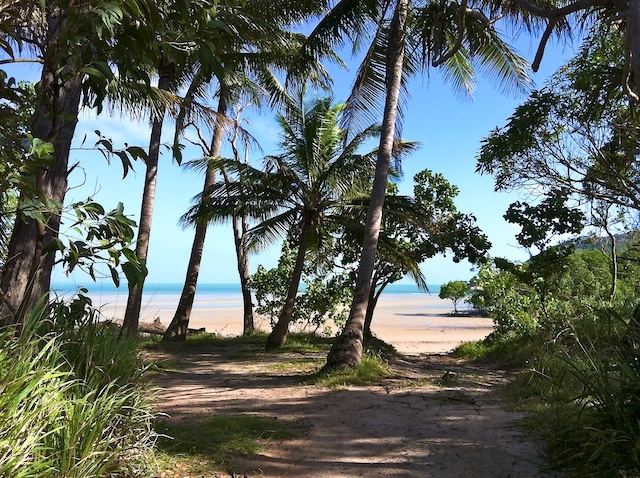 The next day we had to go to Horn Island to catch a plane back to Cairns. When I helped my mum move from her home to a retirement village 23 years ago ( wow, it doesn't seem that long ago) I inherited some old books. They are not in good condition but they are fun to read in that they are so out of date with ideas. This one is called," A Girl's Difficulties" and it belonged to my paternal grandmother. 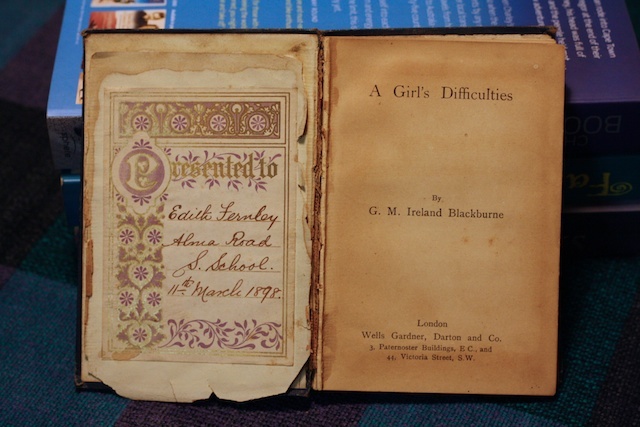 Inside it reads, "Edith Fernley, Alma Road S. School, 11th March 1898"
It is a type of "what every young girl should know" book. Here is a sample of the advice: ......how great is the need for temperance in food and in drink, and in personal self government! ......Except in poorer classes, over-eating is the cause of which never should happen. No one should drink even water between meals except in greatest need. Another of my inherited books is my father's copy of "Aristotle's Works with Illustrations 5s." That is funny having the price in the title on the cover. 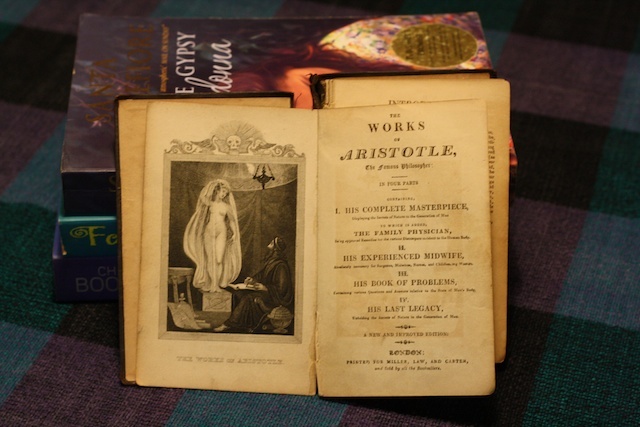 Inside it says, "The Works of Aristotle the Famous Philosopher". I cannot find a date on it anywhere, I vaguely remember being told that my dad found it in a second hand shop. 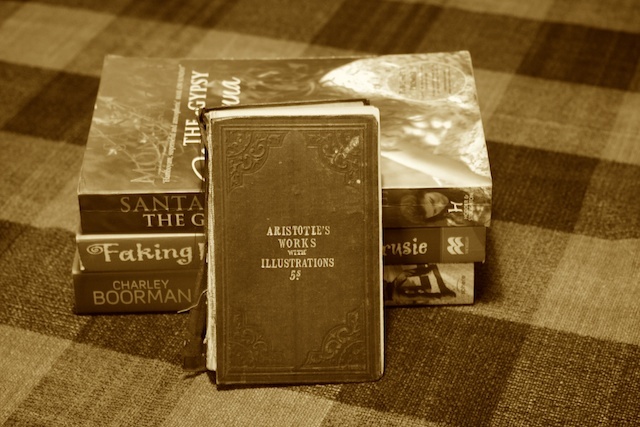 Both books are very small, I've tried to scale them by using today's books as a guide. 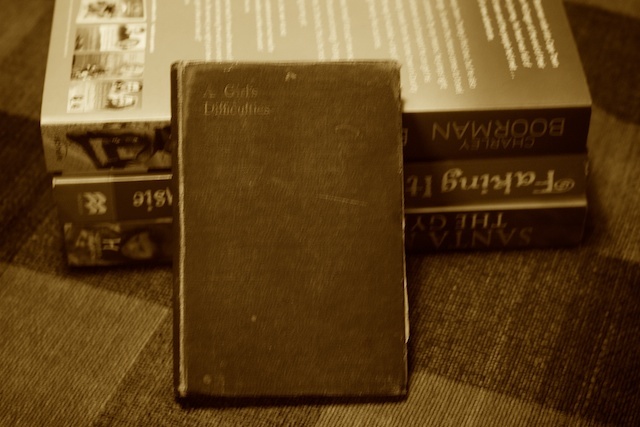 This post is linked to Sepia Saturday and the theme for this week is family bibles, books, hand me downs etc. This was the day I had been looking forward to for some time. The day that I could tick off "Tip of Australia" from my bucket list. 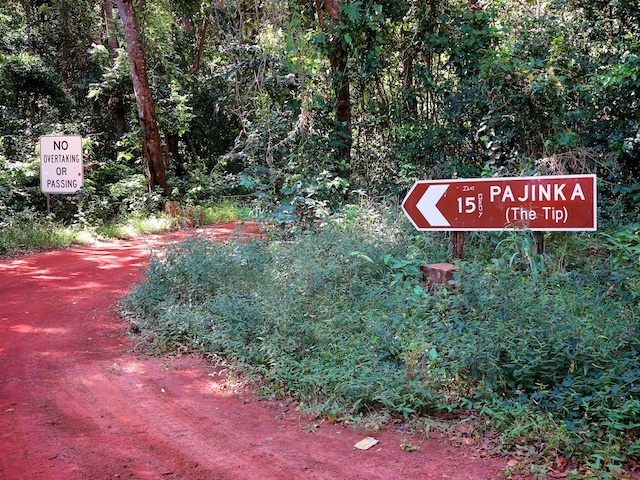 We drove for 34 k on a narrow, rugged red road lined by a variety of different forests. 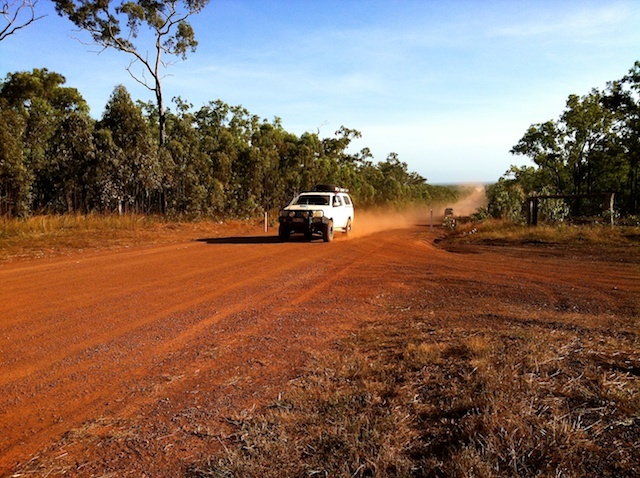 We had a roller coaster ride over huge corrugations, pot holes and creek crossings, it was rough. We were entertained by Adrian, a fellow passenger. It was his turn to sit up front with the driver. He had the mike and was hilariously funny. He was"helping" drive by calling out where the pot holes were but he kept telling us that the driver was purposely driving into the holes. (He wasn't really Chris was a very good driver). Pajinka is the aboriginal name for "The Tip". The graffiti says OBOY. One hopes you don't meet another vehicle. We actually met three in a convoy but the drivers use two way radios to help manoeuvre into a spot where they can pass. The road ended at a small car park and we had to walk the rest of the way. 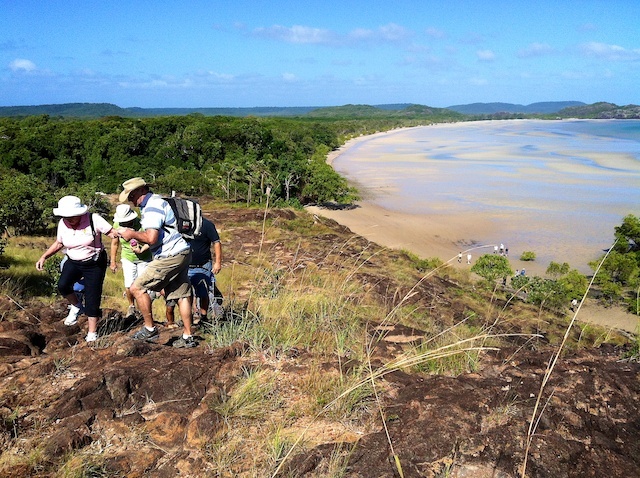 There are two ways to get to the tip; along the beach at low tide or over the rocks. We tried the beach route first but we couldn't get through as rocks had blocked the path and the tide still hadn't gone out enough. So back we went and up over the rocks we scrambled. 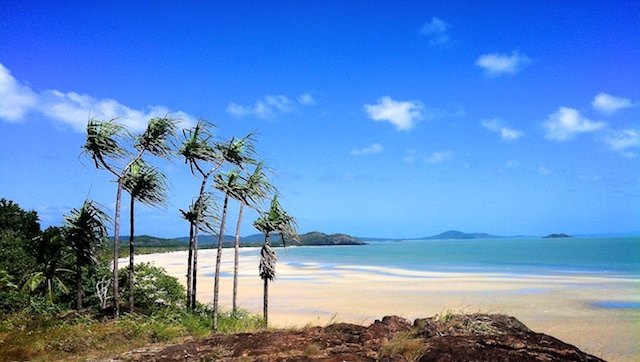 Looking to the west over Frangipani Beach was spectacular. It wasn't long before we could almost see "The Tip". The mainland stops but an island is right opposite the tip. You can't see the water in between yet. We have to get closer. We waited here for everyone to catch up. I was so excited to be here. 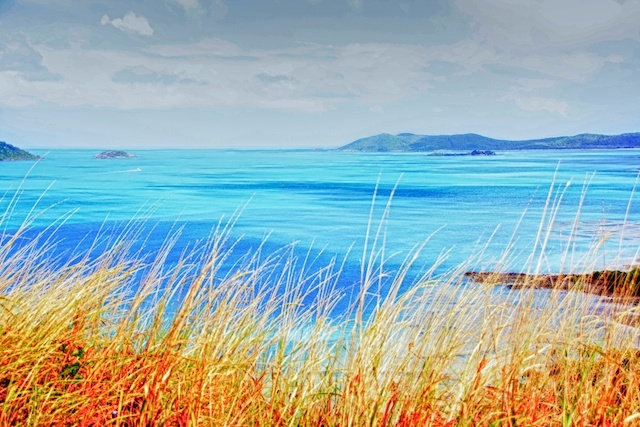 The northern most tip of the Australian mainland. 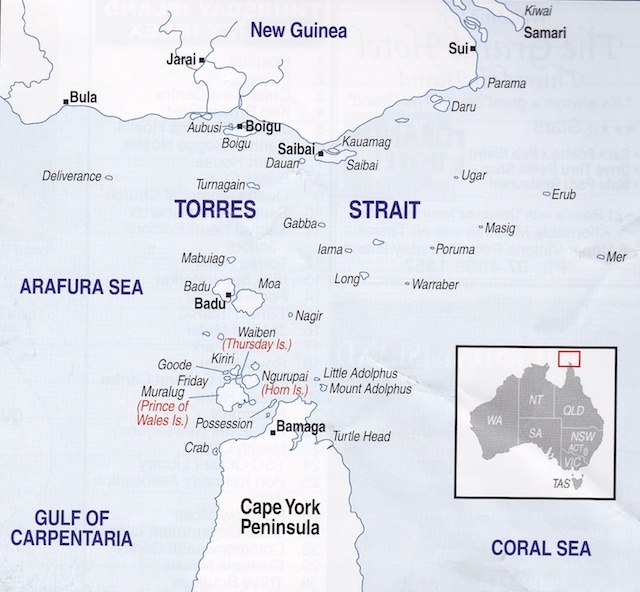 There are many many islands in the Torres Strait between Australia and Papua/New Guinea, which belong to Australia. 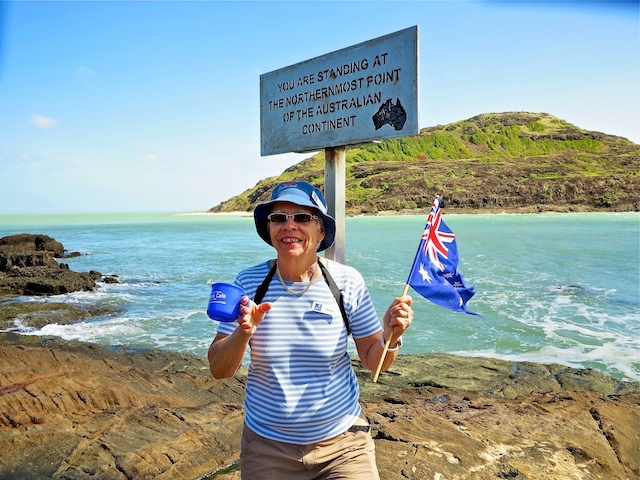 You are standing at the northernmost point of the Australian continent. I am holding the 'stolen' cup from the Bullock Creek Cafe. We were asked to take photos of it in interesting places and post it on their website. See the post here. After everyone had a photo taken and a wondrous look around at the lovely scenery we clammbered up the hill and over the rocks back to the bus. The wind had become very strong and it wasn't an easy walk back trying to hold your hat, camera and keep balance but it was great fun. I loved every minute of it. On the way back we stopped for a picnic lunch at Somerset Beach. 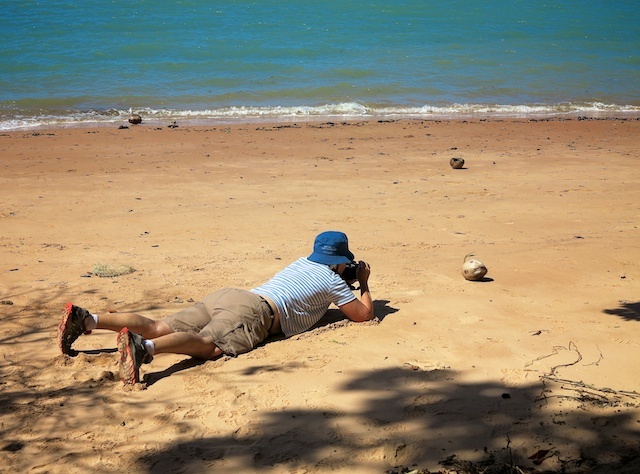 I asked TOH to watch for crocodiles while I tried to get a low down shot but instead he thought it was fun to snap me himself. Somerset has a history. It was originally settled by the government as a northern outpost and defence base but it was unsuccessful due to the lack of a suitable harbour as all supplies were brought by ship. 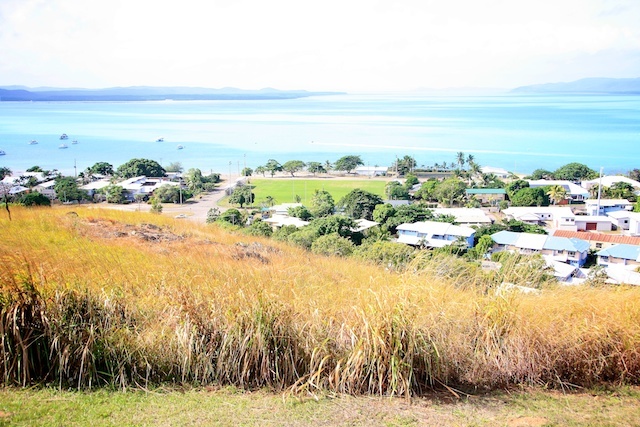 The settlement was moved to Thursday Island, which was the next place on our itinerary. Each segment of the trip passengers took it in turns to sit up front of the bus/truck. This shot was taken at Moreton Station but I just wanted to show you the bus. I turned and took a shot behind me through the hole between the truck and the cabin. It is even more bumpy in the front but at least you can see the holes you are about to fall into. 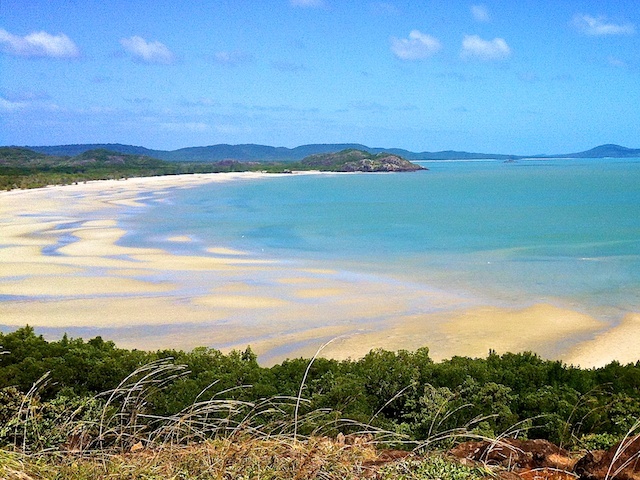 MONSTER MOUNDS AND A CROC FREE SWIM. 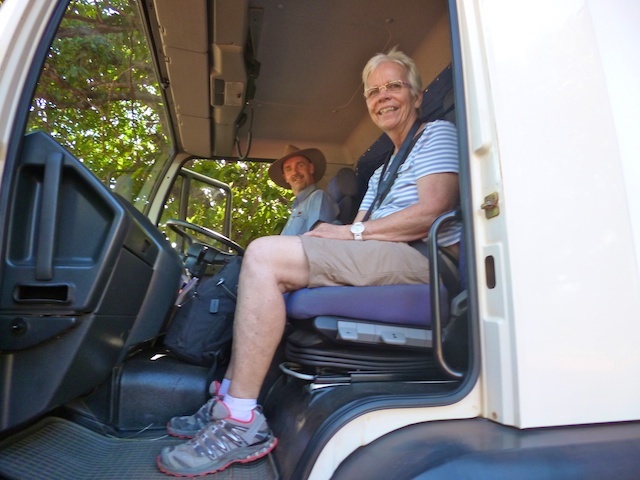 We left Moreton Station after breakfast and headed north again and getting closer and closer to the tip of Australia. However, we had a few interesting stops on the way. My camera was not exposing properly so I resorted to my phone on this day. After driving for a few hours the driver stopped for a break and for us to stretch our legs. The road in this section was in quite good shape. We rarely saw other vehicles so it was quite exciting to see two at once with their red dust cloud following. 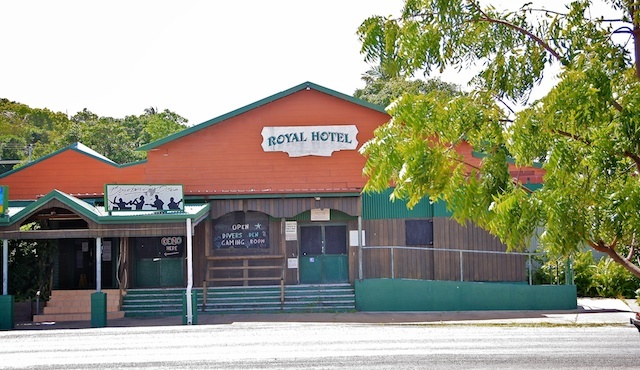 Not long afterwards we pulled into Bramwell Junction Roadhouse for morning tea. 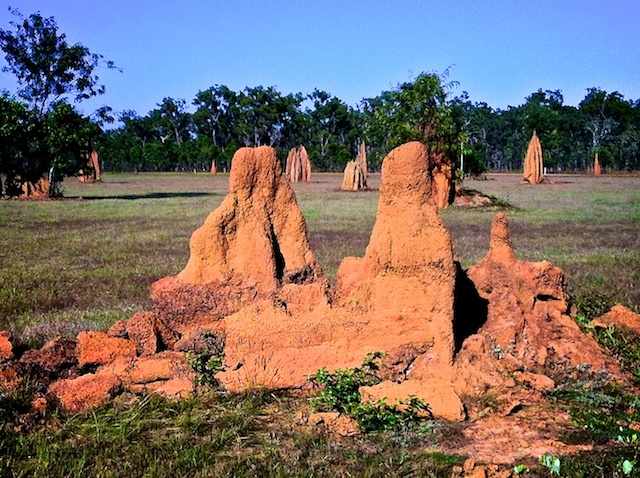 All the way along this road trip we had seen termite mounds (ant's nests). The further north we went, the bigger the mounds. To give you an idea of the size. 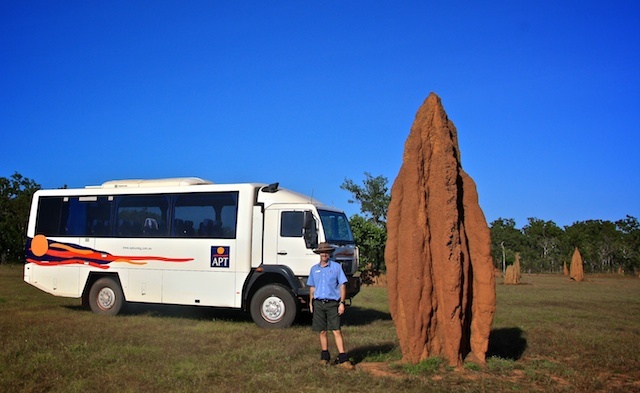 This one is taller than our bus. They are very hard and strong. Some idiots think its fun to try and knock them down by ramming them with their 4 wheel drives. Often the car gets badly damaged as its like hitting concrete. This one was destroyed some weeks ago but the termites are already rebuilding it at a fast rate. 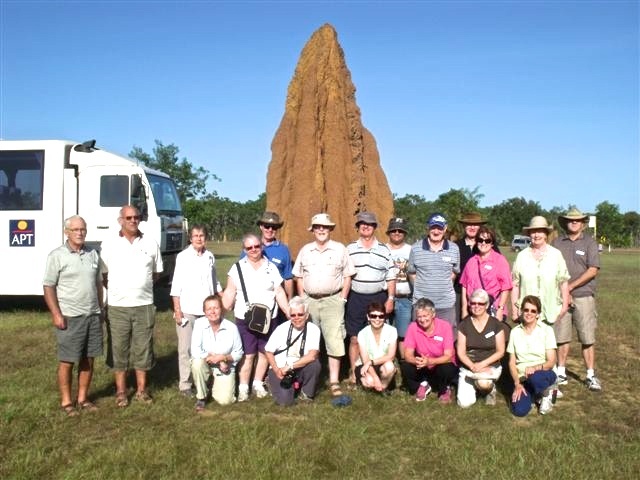 Our tour group. We became like one big family. Everyone was friendly. We were all Australians except for two couples from New Zealand. 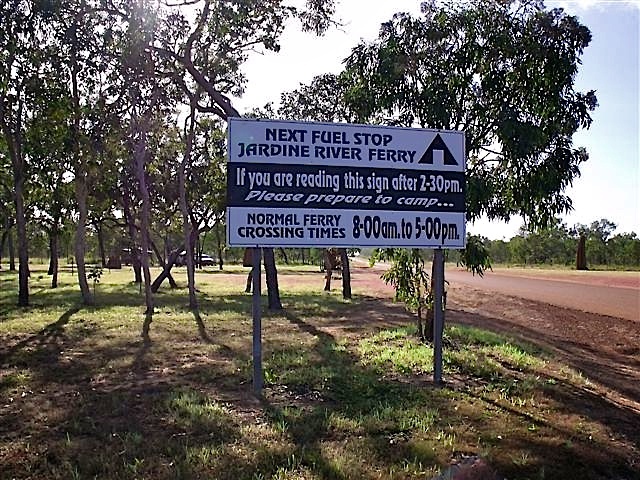 Our destination was the small town of Bamaga for the next two nights but to get there we must cross the Jardine River by ferry. We were safe as we left here before lunch. 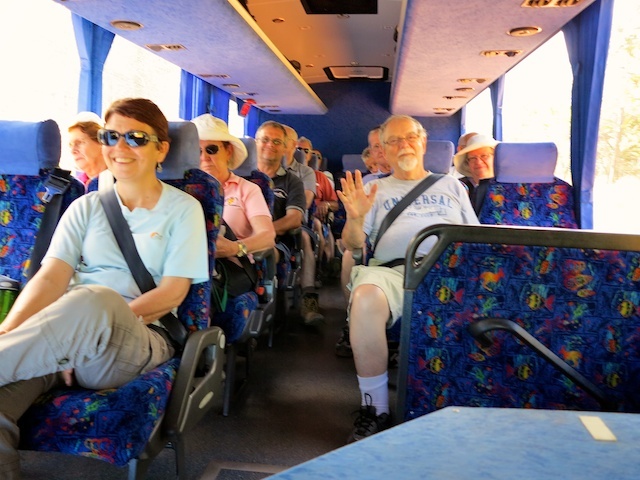 The driver announced that we would have a picnic lunch (which he had packed in the bus) at Fruit Bat Falls. 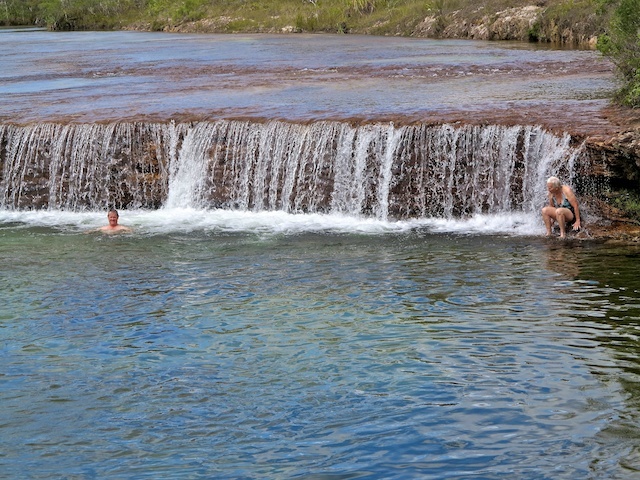 He had told us the night before to wear our swimming togs as we could swim here. "What about the crocodiles?" we all exclaimed. 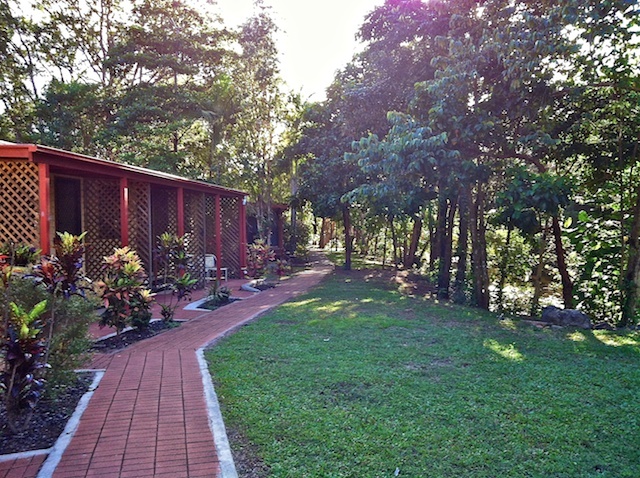 The creek and swimming hole is fed by underground springs and there is no access for estuarine crocodiles. So George and I braved the cold water and enjoyed a swim and a play under the waterfall. It was nice to cool off from the hot, humid weather. We got changed in the bus and sat in the shade for our lunch. After lunch we pushed on to catch the ferry before 5:00pm. 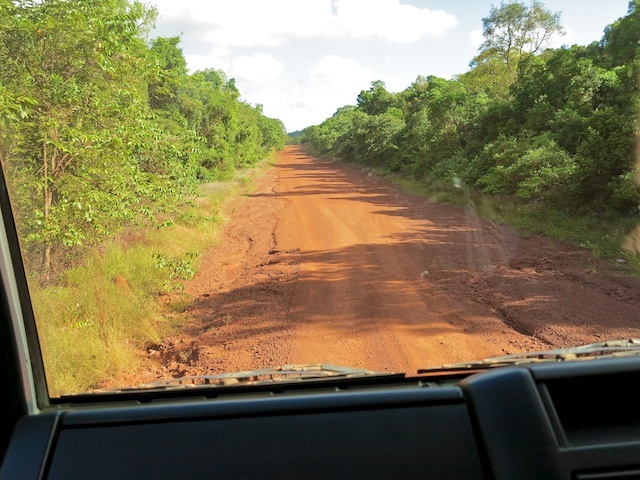 The road had deteriorated and it was very corrugated and bumpy. However, we got to the ferry in time. 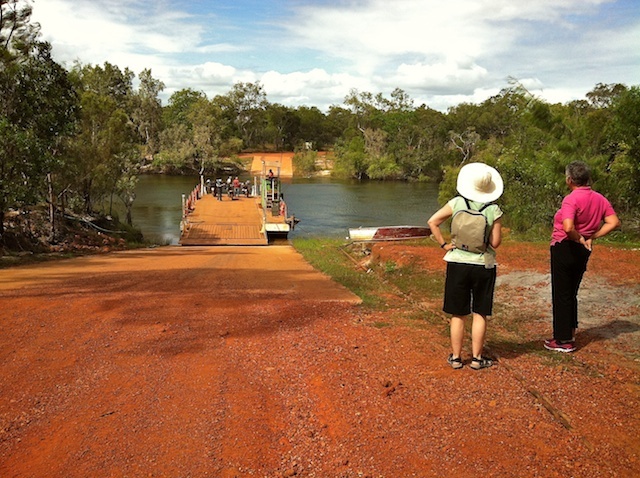 This area is all managed by the aboriginal people and they run the ferry. 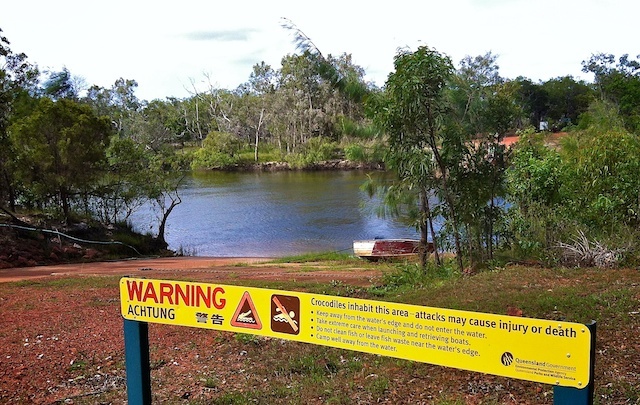 These warning of crocodile signs were often seen near rivers and beaches. 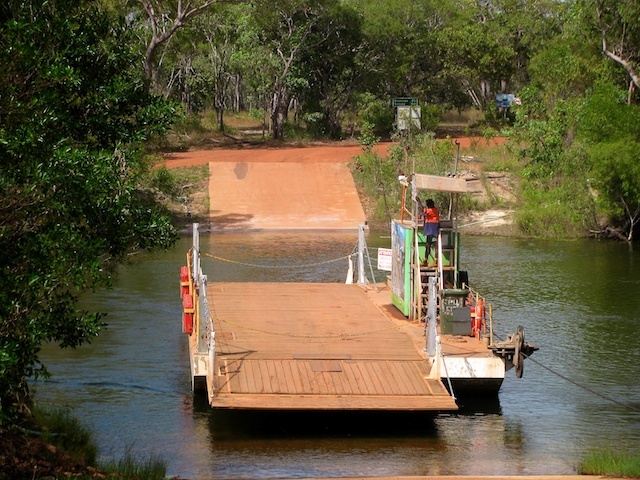 It was a long ride slipping and sliding along the rough road into Bamaga. We were keen to have a cuppa and a rest before dinner. The next day we would finally reach "the tip".